Showing items in category Foreign - Non Commonwealth, sorted by newest listed first. 1898 (FE.11.) 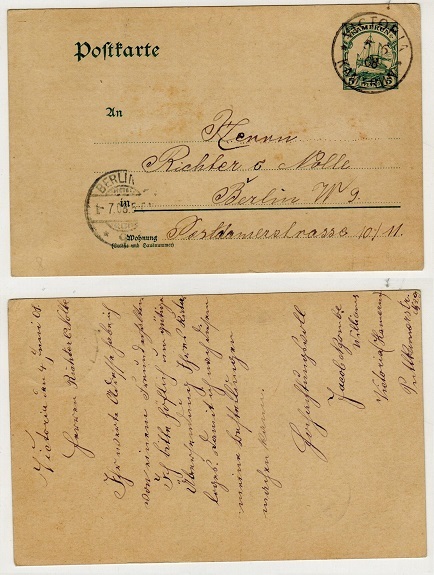 use of 1896 3 pesa on 5 pfg green postal stationery card addressed to Germany maked 'Lindi' on reverse (no message) with additional German 3 pesa on 5pfg/Deutsch Ostafrika' overprint adhesive tied by s/r DAR-ES-SALAAM cds's. H&G 5. SPAIN - 1930's IMPERFORATE '2nd Republic' 25c ESSAY sheetlet. 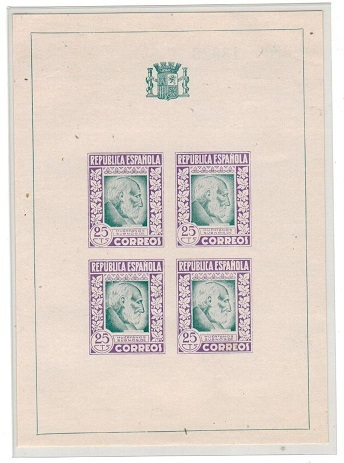 1930's 'Second Republic' 25c violet and green ESSAY in a fine IMPERFORATE sheetlet of four with crest above depicting 'Ramon y Cajal'. Numbered '13626' on reverse side. CYRENAICA (Libya) - 1951 500m orange-yellow and green U/M with OVERPRINT INVERTED. SG 143a. 1951 500m orange-yellow and green 'warrior' overprint adhesive in fine unmounted mint condition showing the major variety OVERPRINT INVERTED. Of the 45 printed only 15 were uncancelled making this a very rare stamp to aquire. SG 143a. 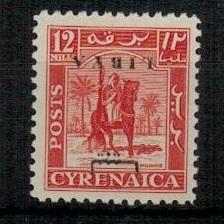 CYRENAICA (Libya) - 1951 12m scarlet U.M with OVERPRINT INVERTED. SG 138a. 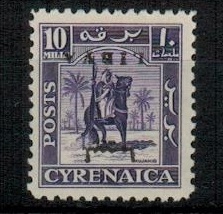 CYRENAICA (Libya) - 1951 10m violet U/M with OVERPRINT INVERTED. SG 137a. 1951 10m violet 'warrior' overprint adhesive in fine unmounted mint condition showing the major variety OVERPRINT INVERTED. Much under rated by SG as only 100 were printed. SG 137a. 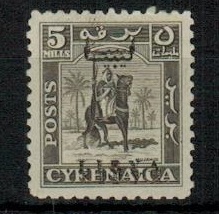 CYRENAICA (Libya) - 1951 5m grey-brown used with OVERPRINT DOUBLE. SG 136b. 1951 5m grey-brown in fine used condition showing the major error OVERPRINT DOUBLE. SG 136b. CYRENAICA (Libya) - 1951 8m orange U/M with OVERPRINT INVERTED. SG 136a. 1951 8m orange 'warrior' overprint adhesive in fine unmounted mint condition showing the major variety OVERPRINT INVERTED. Much under rated by SG as only 100 were printed. SG 136a. 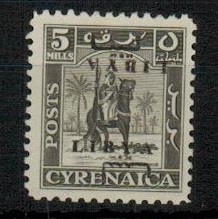 CYRENAICA (Libya) - 1951 5m grey-brown used with OVERPRINT INVERTED. SG 135c. 1951 5m grey-brown in fine used condition showing the major vaiety OVERPRINT INVERTED. Only 50 examples can exist. SG 135c. 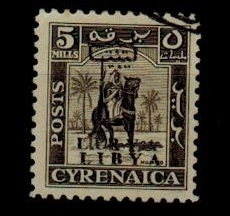 CYRENAICA (Libya) - 1951 5m grey-brown U/M with OVERPRINT DOUBLE. SG 135b. 1951 5m grey-brown 'warrior' overprint adhesive in fine unmounted mint condition showing the major variety OVERPRINT DOUBLE. Much under rated by SG as only 100 were printed. SG 135b. 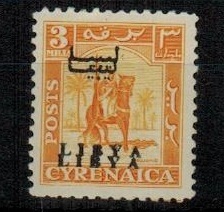 CYREANAICA (Libya) - 1951 5m grey-brown U/M with OVERPRINT DOUBLE ONE INVERTED. SG 135a. 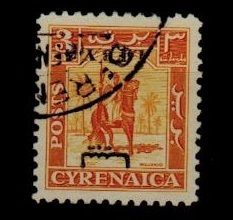 CYRENAICA (Libya) - 1951 3m orange-yellow used with OVERPRIN INVERTED. SG 133b. 1951 3m orange -yellow in fine used condition showing the major variety OVERPRINT INVERTED. SG 133b. CYRENAICA (Libya) - 1951 3m orange-yellow U/M with OVERPRINT DOUBLE. SG 133a. 1951 3m orange-yellow 'warrior' overprint adhesive in fine unmounted mint condition showing the major variety OVERPRINT DOUBLE. Much under rated by SG as only 100 were printed. SG 133a. COLONIAL PROOFS - 1900 (circa) DE LA RUE 'DIE PROOF' depicting head from unknown country. 1900 (circa) 'De La Rue' DIE PROOF printed in black on white glazed card depicting head in black surround affixed to official card. Appears to be an unissued design for possibly a Balkan country. 1900 (circa) 'De La Rue' DIE PROOF printed in black on white glazed card depicting head affixed to official card. Appears to be an unissued design for possibly a Balkan country. 1900 (circa) 'De La Rue' DIE PROOF printed in black on white glazed card depicting head in black surround affixed to official card. Appears to be an unissued design for possibly a Balkan country. Marked in manuscript 'December 1900' . 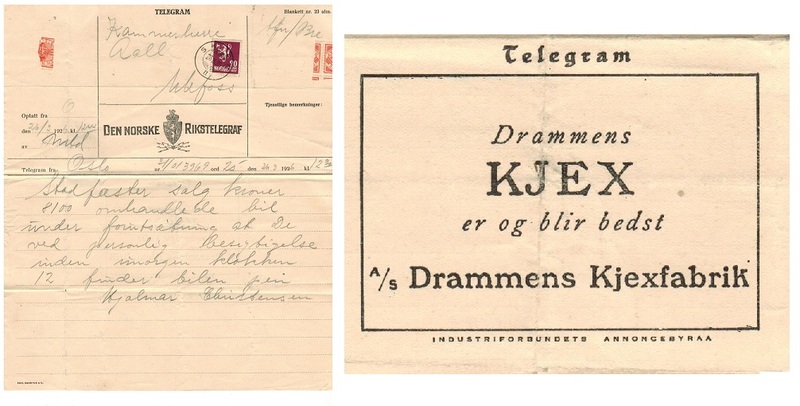 NORWAY - 1926 TELEGRAM sheet used locally bearing 20 ore adhesive used at SKIEN. 1926 (26.III.) 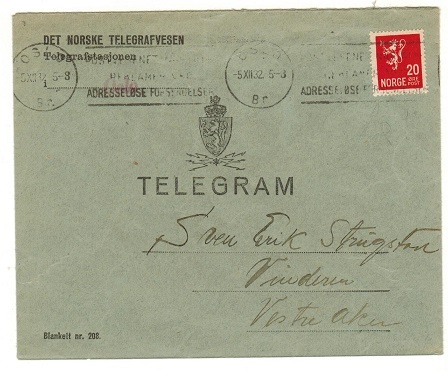 DEN NORSKE RIKSTELEGRAF telegram sheetbearing 20 ore adhesive tied SKIEN and with part telegram sealing stamps at left. NORWAY - 1932 TELEGRAM envelope bearing 20 ore adhesive used at OSLO. 1932 (5.XII.) black on grey TELEGRAM envelope addressed locally bearing 20 ore adhesive tied OSLO slogan strike. 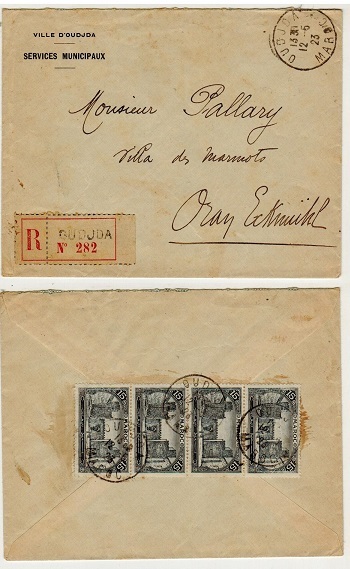 MOROCCO AGENCIES (Spanish Zone) - 1921 30c VERTICALLY BISECTED local cover used at TETUAN. 1921 (25.2.) 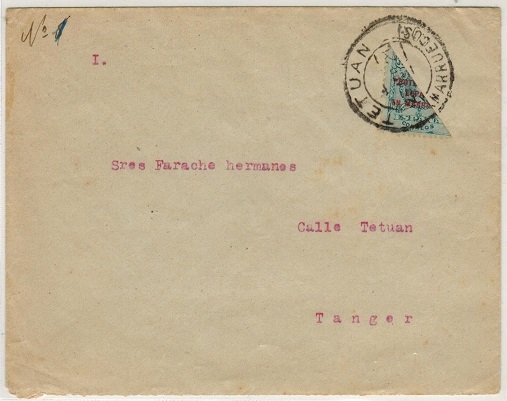 cover addressed locally to Tangier bearing 30c 'Zona De/Protectorado/Espanol/ En Marruecos' overprinted adhesive VERTICALLY BISECTED and cancelled TETUAN. 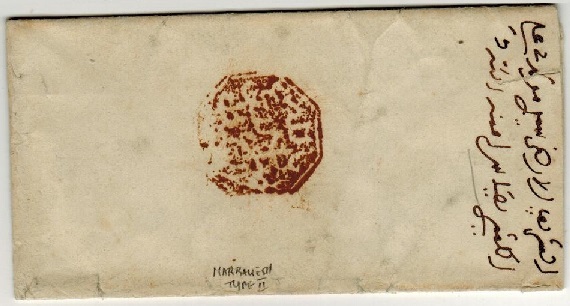 MOROCCO AGENCIES - 1890 (circa) 'Cherifen Post' intaglio seal cover used at MARRAKESH. 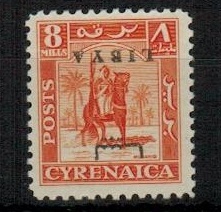 1890 (circa) locally addressed cover in Arabic cancelled by Cherifien Post intaglio strike of Marrakesh in black ink. MOROCCO AGENCIES (French Offices) - 1912 5c on 10c rose PSE to France used at TANGER. 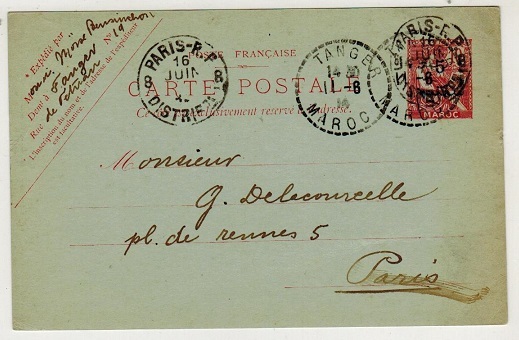 1912 5c on 10c surcharged rose on greenish postal stationery postcard addressed to France cancelled by TANGIER/MAROC cds dated 11.6.14. H&G 10. MOROCCO AGENCIES (French Offices) - 1920 25c/25c blue rate postcard use to France used at RABAT. 1920 (18.6.) 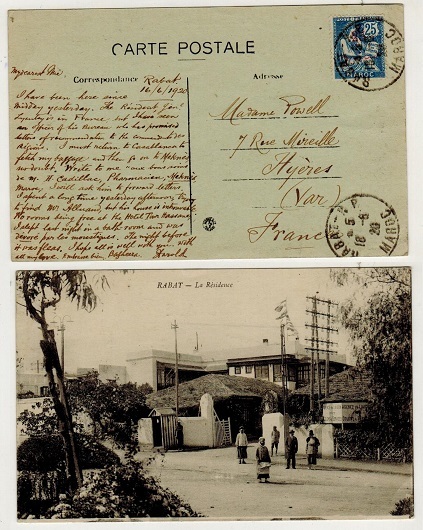 use of picture postcard addressed to France depicting 'Rabat -La Residence' bearing 25c on 25c blue surcharged French Morocco adhesive tied by RABAT R.P./MAROC cds. MOROCCO AGENCIES (French Offices) - 1923 60c rate cover used locally at OUDJDA/MAROC. 1923 (12.5.) registered cover addressed locally bearing Maroc 15c (x4) on reverse flap cancelled by OUDJDA/MAROC cds's with additional strike on the front and red on cream blank type R/No. registered label at left handstamped OUDJDA in black. MOROCCO AGENCIES (German Offices) - 1889 3pfg brown unused postal stationery wrapper. H&G 8. 1889 3 pfg brown on buff postal stationery wrapper of Germany (H&G 8) overprinted MAROCCO/3 CENTIMES in black with DRUCKSACHE struck at left. Fine and scarce. MOROCCO AGENCIES (German Offices) - 1907 10pfg postcard use to UK used at MAZAGAN. 1907 (4.12.) use of picture postcard addressed to UK depicting 'Moors Beggars-Tangier' bearing German 10pfg adhesive overprinted MAROCCO/10 CENTIMOS and cancelled by MAZAGAN/ (MAROCCO)/DEUTSCH POST cds with GIBRALTAR transit cds at left. MOROCCO AGENCIES (German Offices) - 1912 40pfg rate cover to Austria used at TANGER. 1912 (13.5.) 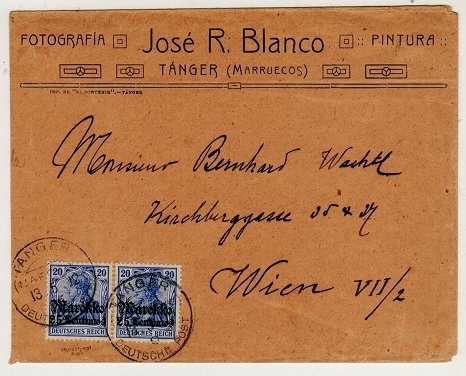 use of commercial cover addressed to Austria bearingh German 20pfg blue pair tied by TANGER/MAROCCO/DEUTSCH POST cds's. 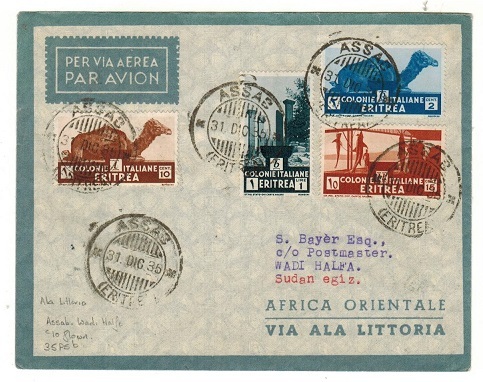 SUDAN - 1935 inward first flight cover from Italian Eritrea by 'Ala Littoria'. 1935 (31.DIC.) inward first flight cover from Italian Eritrea cancelled by ASSAB/ERITREA cds and with part WADI HALFA arrival b/s. Only ten covers were flown by 'Ala Littoria'. Rare item. TANGANYIKA (Belgian Occupation) - 1917 10c red-brown PSC cancelled KIGOMA. H&G 2. 1917 10c red-brown on cream postal stationery postcard depicting a view of 'Vers La Kagera-Transport de Bagages' on reverse and cancelled by KIGOMA cds dated 29.JA.20. A scarce military card overprinted for use by the Belgium Occuptation Forces. H&G 2. 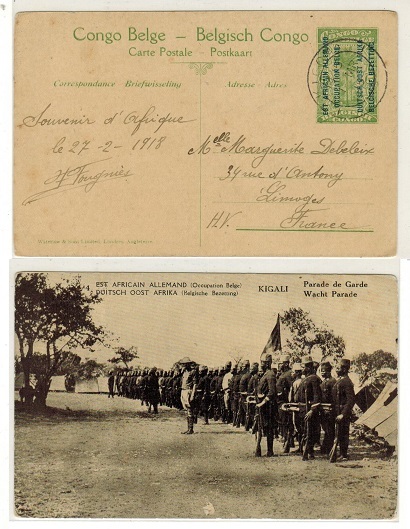 TANGANYIKA (Belgian Occupation) - 1917 5c yellow-green PSC to France used at KIGOMA. H&G 1. 1917 5c yellow-green on cream postal stationery postcard depicting a view of 'Kigali-Parade De Garde' on reverse and cancelled by KIGOMA cds dated 1.MR.18. A scarce military card overprinted for use by the Belgium Occuptation Forces. H&G 1. CAMEROONS (German Offices) - 1904 5pfg green PSC to Germany used at JABASSI. H&G 14. 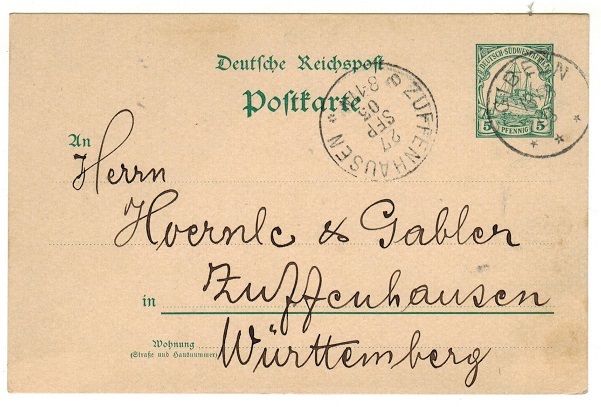 1904 5pfg green on cream postal stationery postcard of German Kameroons (H&G 14) addressed to Germany (genuine use) and cancelled by JABASSI/KAMERUN cds dated 5/11/06. 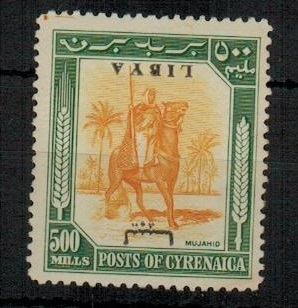 CYRENAICA (Libya) - 1951 'Postage Due' short set to 40m on piece used at SHAHAT. SG D144-49. 1951 'Postage Due' short set to the 40m (6 values) each on piece and cancelled by scarce SHAHAT cds's used on the first day of issue 24.12.51. SG D144-149. TANGANYIKA (Belgian Occupation) - 1917 10c red-brown PSC to Belgium used at KIGOMA. H&G 2. 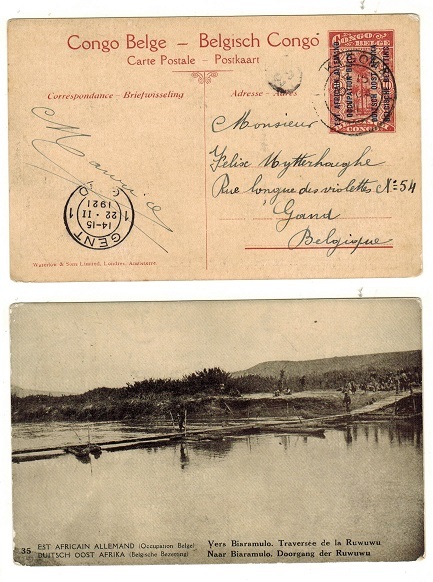 1917 10c red-brown on cream postal stationery postcard overprinted 'Occupation Belge' for the Belgian forces depicting 'Les Marais De La Kagera' view on reverse side addressed to Belgium and cancelled KIGOMA and dated 5.JN.18. H&G 2. 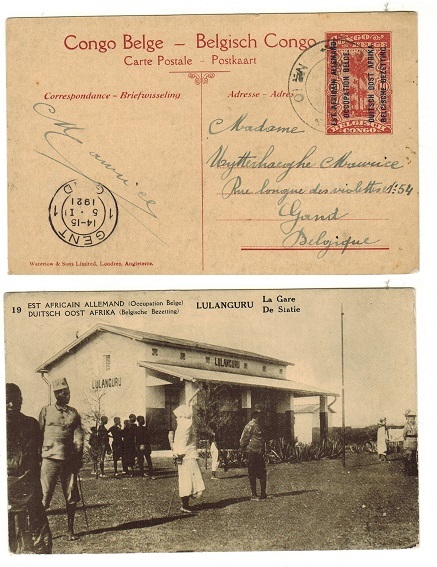 TANGANYIKA (Belgian Occuptation) - 1917 10c red-brown PSC to Belgium used at KIGOMA. H&G 2. 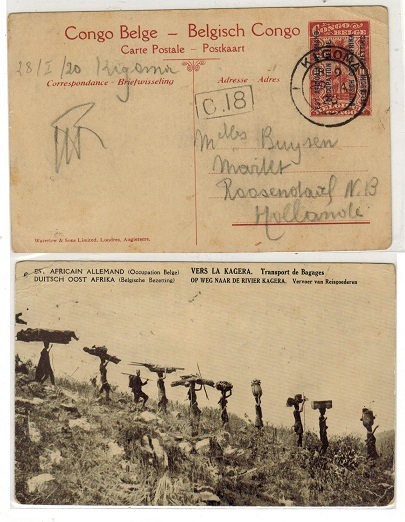 1917 10c red-brown on cream postal stationery postcard overprinted 'Occupation Belge' for the Belgian forces depicting 'Vers Biaramulu Traversee de la Ruwuwu' view on reverse side addressed to Belgium and cancelled KIGOMA and dated10.JA.21. H&G 2. 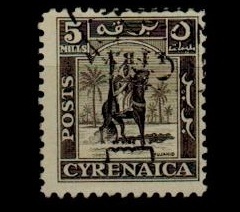 CYRENAICA (Libya) - 1951 'Mounted Warrior' set of 13 fine mint. SG 131-143. 1951 'Mounted Warrior' series of 13 values in fine lightly mounted mint condition. SG 131-143. CYRENAICA (Libya) - 1951 'Mounted Warrior' set of 13 fine used. SG 131-143. 1951 'Mounted Warrior' series of 13 values in fine used condition. SG 131-143. 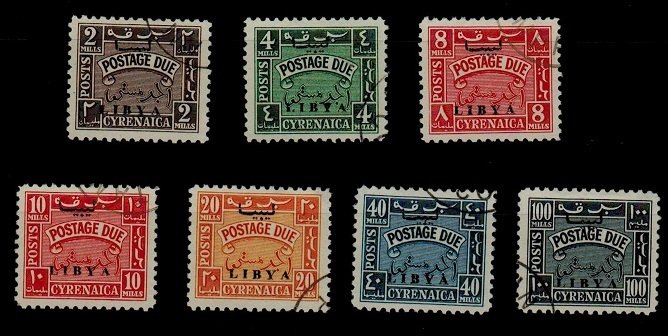 CYRENAICA (Libya) - 1951 'Postage Due' series of 7 unmounted mint. SG D144-150. 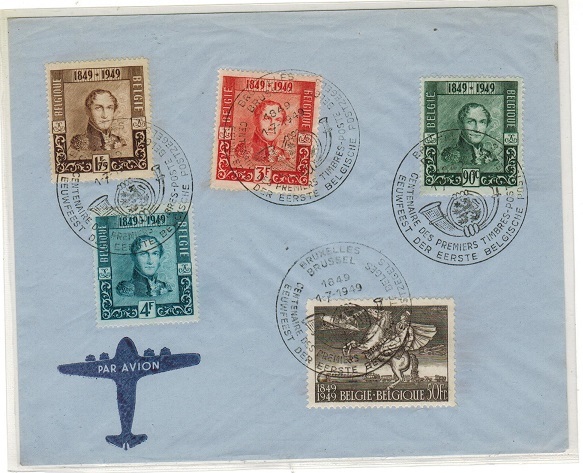 1951 'Postage Due' series of seven in unmounted mint condition. The 2m and 4m with one very light tone spot on perf. SG D144-150. CYRENAICA (Libya) - 1951 'Postage Due' series of seven mint. SG D144-150. 1951 'Postage Due' series of seven in fine mint condition. SG D144-150. 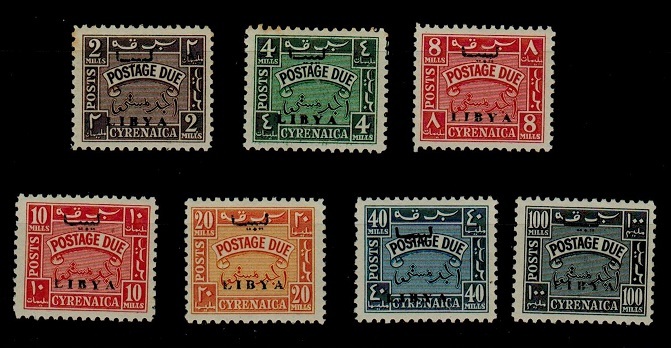 Cyrenaica (Libya) - 1951 'Postage Due' series of 7 used. SG D144-150. 1951 'Postage Due' series of seven in used condition. SG D144-150. 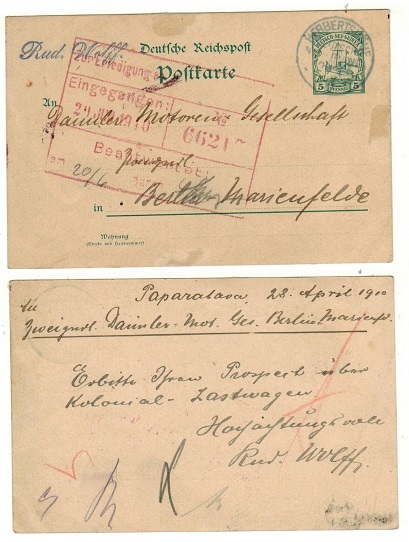 CAMEROONS (German Offices) - 1904 5pfg green PSC to Germany used at DSCHANG. H&G 14. 1904 5pfg green on cream postal stationery postcard addressed to Germany (genuine use) cancelled by DSCHANG/KAMERUN cds dated 29.9.09. H&G 14. NEW GUINEA (German Offices) - 1900 5pfg green PSC used at HERBERTSHOHE. H&G 8. 1900 5 pfg green on cream postal stationery postcard of Deutsch Neu Guinea addressed to Manicufelde from Paparalava and cancelled by HERBERTSHOHE cds dated 29.4.10. H&G 8. 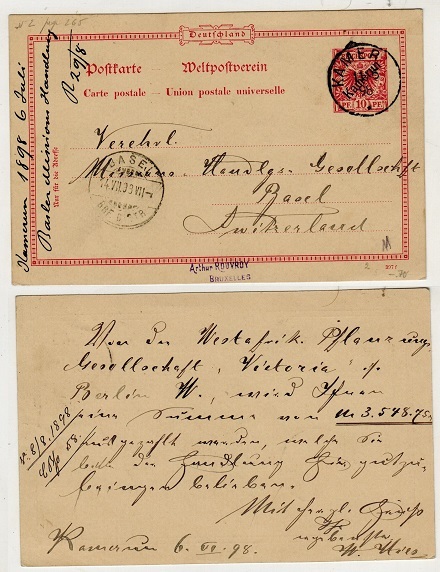 NEW GUINEA (German Offices) - 1900 10pfg PSC to Germany used at FRIEDRICH WILHELMSHAFEN. H&G 9. 1900 10pfg carmine on cream German Deutsch Neu Guinea 'yacht' postal stationery postcard addressed to Germany (genuine use) cancelled by FRIEDRICH-WILHELMSHAFEN cds dated 3.9.01. H&G 9. 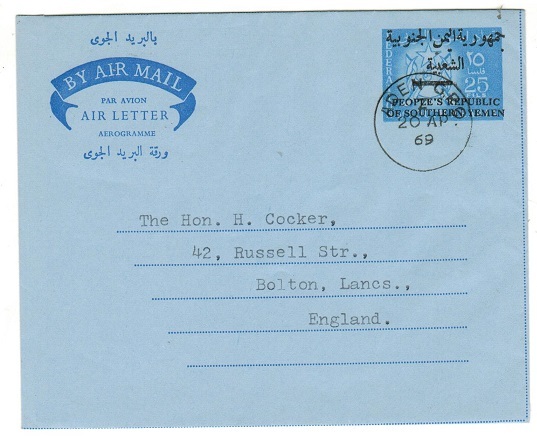 ADEN - 1968 (circa) blue on blue postal stationery air letter cto'd by ADEN GPO. 1968 (circa) blue on blue postal stationery air letter overprinted in black PEOPLES REPUBLIC/OF SOUTHERN YEMEN addressed to UK and cto'd by ADEN GPO cds dated 20.AP.69. ADEN - 1956 10b red 'airmail' postal stationery envelope in fine unused condition. 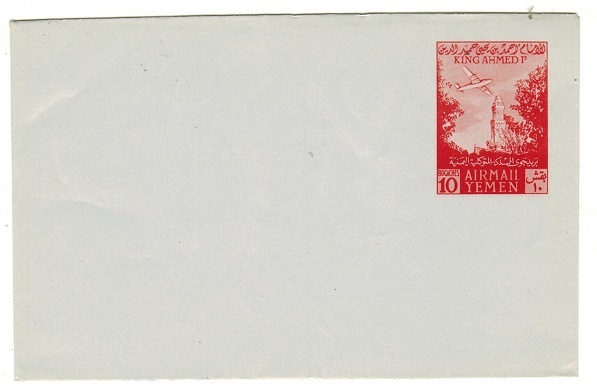 1956 10b red 'airmail' postal stationery envelope in fine unused condition. ADEN - 1965 (circa) 70f dark blue on blue aerorgramme unused. 1965 (circa) 70f dark blue on blue aerorgramme in fine unused condition issued for the 'Peoples Democartic Republic of Yemen. ADEN - 1970 (circa) 40f green and red-orange on blue aerorgramme unused. 1970 (circa) 40f green and red-orange on blue aerorgramme in fine unused condition issued for the Peoples Democartic Republic of Yemen. ADEN - 1970 (circa) 25f dark blue and red-orange on blue aerorgramme unused. 1970 (circa) 25f dark blue and red-orange on blue aerorgramme in fine unused condition issued for the Peoples Democartic Republic of Yemen. U.S.A. - 1986 $28.05 'Eagle' BOOKLET. 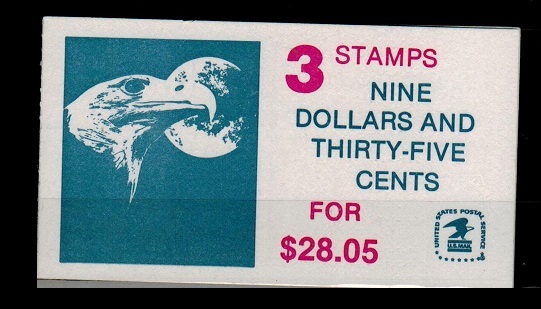 1986 $28.05 blue and red on white 'Eagle' BOOKLET complete with 3 $9.35 adhesives. 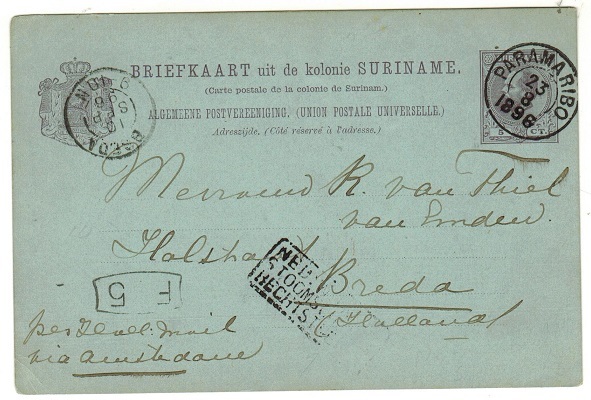 SURINAM - 1896 5c violet on blue PSC to Holland with Royal Dutch Line handstamp. 1896 (23.8.) 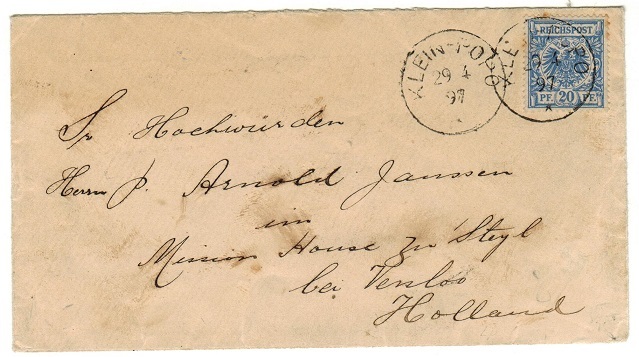 use of 5c violet on blue postal stationery postcard addressed to Holland cancelled by PARAMARIBO cds and struck by boxed NED.W.INDIE/STOOMSCHEPEN/RECHTSTREEKS h/s at lower left. This being a Royal Dutch Line maritime handstamp. JORDAN - 1990 ROYAL PALACE/AMANN cover to USA. 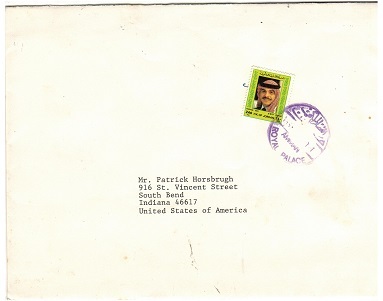 1990 cover addressed to USA bearing 240fils adhesive tied by violet ROYAL PALACE/AMMAN cds and complete with original contents. NETHERLANDS - 1967 'Amphilex 67' 20c, 25c and 75c adhesives in miniature sheets. SG 1035-37. 1967 'Amphilex 67' 20c, 25c and 75c adhesives in miniature sheets of 10 as sold at the exhibition. SG 1035-37. SWITZERLAND - 1959 red and green on gold 'Pro Juventute' BOOKLET. SG JSB9. 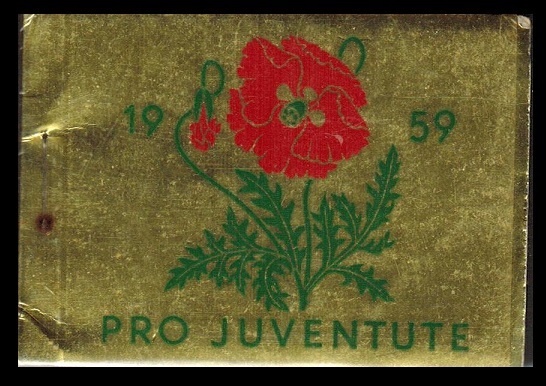 1959 red and green on gold 'Pro Juventute' BOOKLET. SG JSB9. U.S.A. - 1933 50c 'Graf Zeppelin' U/M marginal example. SG A732. 1933 50c 'Graf Zeppelin' adhesive in a fine unmounted mint bottom marginal example. Some very light surface gum loss from being attached to lower sheets but still very collectable and is nicely centred. SG A732. 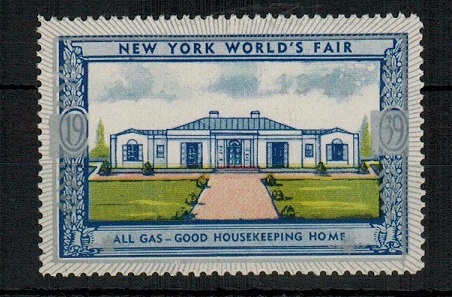 U.S.A. - 1940 'NY World Fair' U/M label. 1940 'New York World's Fair' perforated adhesive label in fine unmounted mint condition having the year 1939 blanked out in silver and 1940 applied. U.S.A. - 1975 'Liberty Bell' U/M FORGERGY. 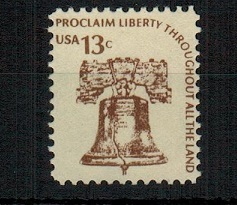 1975 13c 'Liberty Bell' adhesive in fine unmounted mint condition of the notorious POSTAL FORGERY which was seized by the Columbus and Dayton police in Ohio in August 1976. 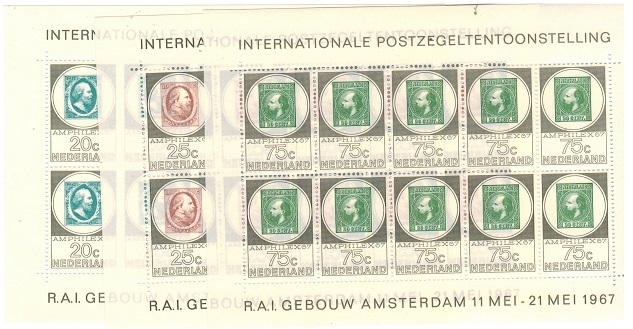 The stamp being a slightly paler shade and having a wider perforation of 11 3/4. SG 1595. ADEN (Yemen) - 1948 2b 'United Nations' U/M example with IMPERFORATE PLATE PROOF in orange. 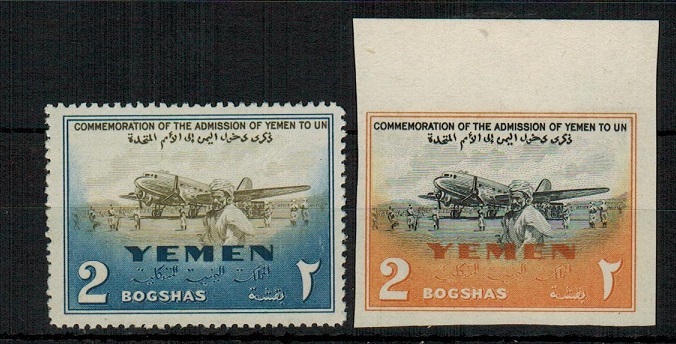 1948 2b 'Admission of Yemen to UN' adhesive in unmounted mint condition (SG do not list the UN issue' together with a scarce 2b IMPERFORATE PLATE PROOF example printed in orange and black. 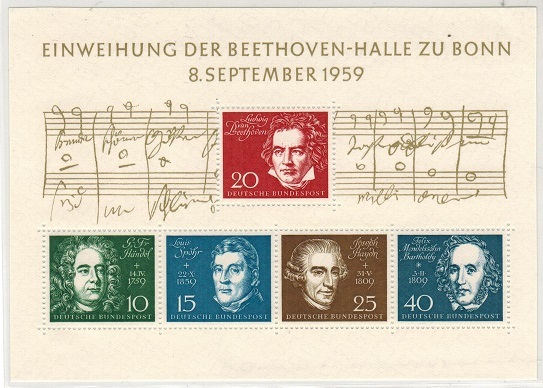 GERMANY - 1959 'Beethoven' miniature sheet U/M. SG MS1233a. 1959 'Inauguration of Beethoven' miniature sheet in fine unmounted mint condition. SG MS1233a. 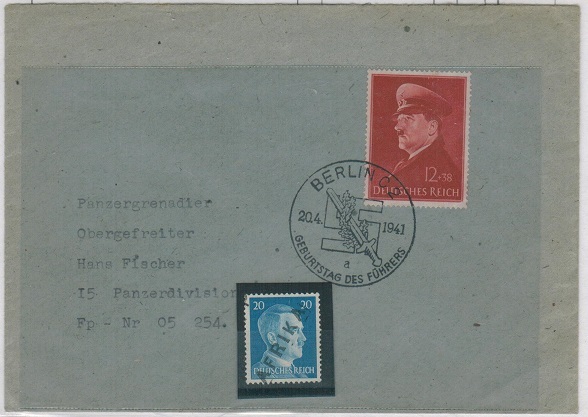 GERMANY - 1941 cover addressed to 'Panzer Division 15' which was at Derna. 1941 (20.4.) cover addressed to 'Panzer Division 15' which was one of the advance feldpost's set up at Derna (opened April 14th 1941)for the swift advancing Korps. The cover bears 12+38pfg Deitsch Reich adhesive tied BERLIN C2/GEBURTSTAG DES FUHRERS. Also a copy of the 20pfg 'Hitler' stamp handstamped AFRIKA. This was overprinted due to a shortage of the 20pf stamp which was used by troops allowing them to send home once a month. The overprinting was deemed against regulation since it defaced Hitlers head. Apparently these are scarce. TANGANYIKA (Belgian Occupation) - 1917 10c 'Military' PSC to Belgium cancelled B.P.C.V.P./No.10. 1917 10c red-brown on cream postal stationery postcard overprinted 'Occupation Belge' for the Belgian forces depicting 'Lulanguru-La Gare' view on reverse side addressed to Belgium anmd cancelled by scarce B.P.C.V.P./ No.10 cancel. The date is unclear but with GENT arrival dated 5.1.21. H&G 2. FRANCE - 1859 40c rate cover to UK cancelled by 'E' retta type h/s. 1859 (6.19.) 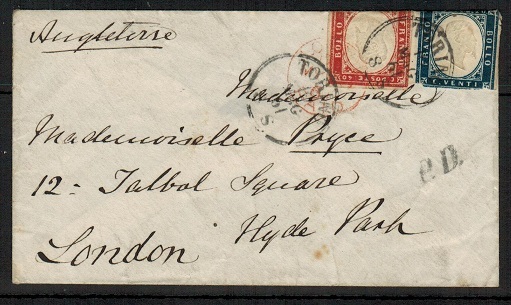 cover addressed to UK bearing 40c orange (oxidised) cancelled by 'E' retta cancel with PARIS cds alongside and red LONDON/PAID arrival below. 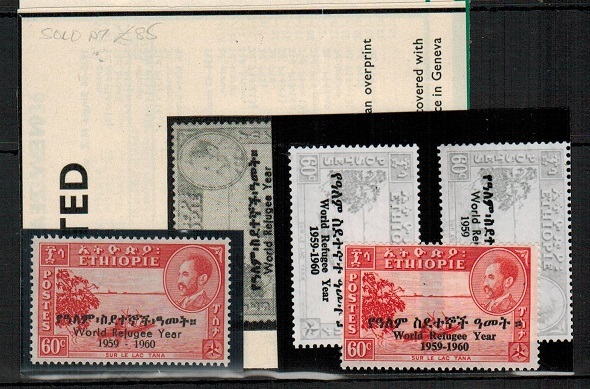 ETHIOPIA - 1960 60c 'Refugee Year' adhesive U/M with WIDE SPACING error. SG 499. 1960 60c carmine-red 'World Refugee Year' adhesive in fine unmounted mint condition of the rare unlisted setting showing the WIDE SPACING BETWEEN YEAR which came from a very small number discovered in copies presented to the U.N. office in Geneva for sales to benefit the W.R.Y. Fund. The stamp is noted in the SG footnote but unpriced. SG 499. BELGIUM - 1949 'Stamp Centenary' unaddressed FDC. 1949 (1.7.) 'Belgium Stamp Centenary' unaddressed first day cover bearing the set of five (SG 1271-75) including the 50f air adhesive tied by special CENTENARY DES PREMIERS cancels. 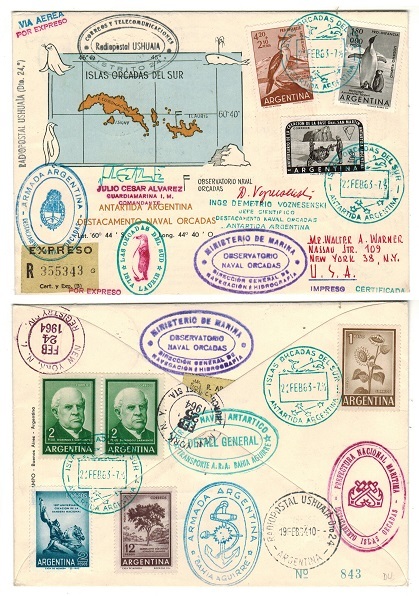 ARGENTINA (South Orkney Islands) - 1963 registered EXPRESS cover to USA from Argentine Observatory. CAMEROONS (German) - 1907 10pfg rate postcard use to USA used at DUALA with official JAUNDE label. 1907 (DEC.1) use of picture postcard addressed to USA depicting 'Buley-Leute' bearing German Kamerun 5pfg green 'yatch' pair tied by DUALA/KAMERUN cds's and with blue circled cog wheeled KAISERL REGIERUNGSTATION/JAUNDE embossed seal at left. 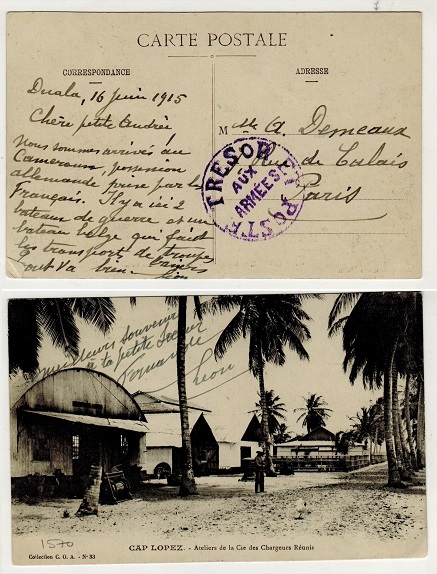 CAMEROONS (French) - 1915 'TRESOR ET POSTE/AUX/ARMEES' strike on postcard to France. 1915 (JUN.16.) use of stampless picture postcard addressed to France struck by scarce violet TRESOR ET POSTE/AUX/ARMEES handstamp with the text mentioning Belgium troop boat carrier. This being prior to the French occupation issues (hence unstamped). 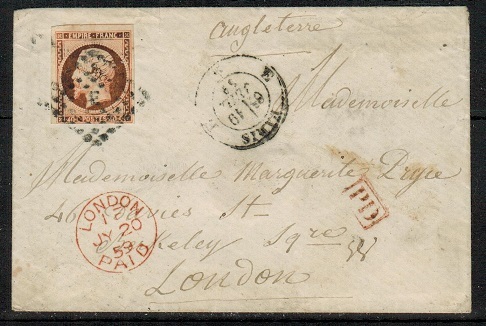 ITALY (Sardinia) - 1861 30c rate cover to UK used at TORTLI. 1861 (AUG.1.) cover addressed to UK bearing 10c and 20c 'Victor Emmanuel' adhesives folded over the top edge and cancelled by TORTLI cds's. JAPAN - 1938 'Parks' U/M miniature sheet with original folder. SG MS349. 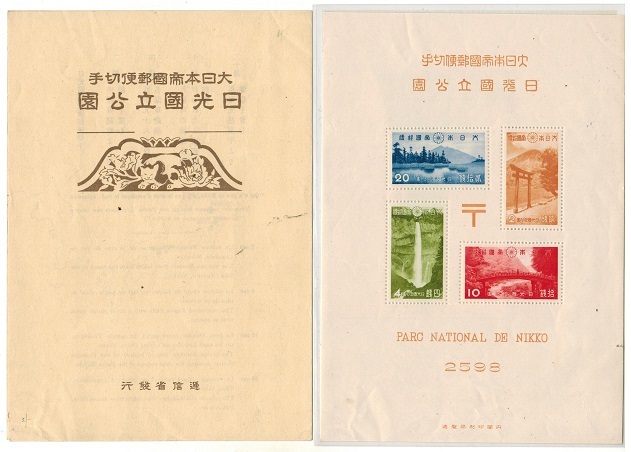 1938 'National Parks' miniature sheet in fine unmounted mint condition complete with the original presentation folders which were sold at a premium on 50s at the time. SG MS349. CAMEROONS (German) - 1904 5pfg green PSC to Germany used at VICTORIA. H&G 14. 1904 5pfg green 'German Kamerun' postal stationery postcard addressed to Germany (genuine use) cancelled by VICTORIA/KAMERUN cds dated 5.6.08. H&G 14. 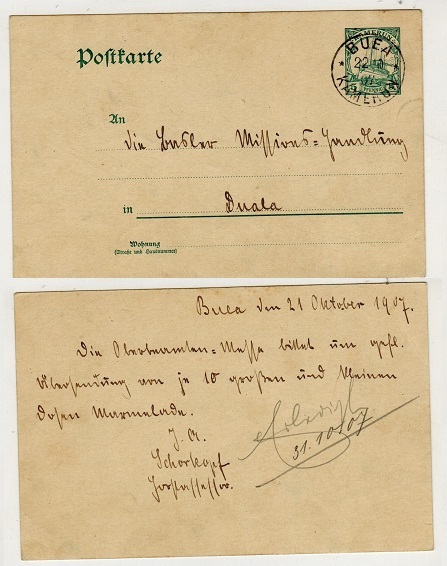 CAMEROONS (German) - 1904 5pfg green PSC used locally to Duala cancelled BUEA. H&G 14. 1904 5 pfg green on cream postal stationery postcard of 'Kamerun' addressed locally to Duala and cancelled by BUEA/KAMERUN cds dated 22.10/07. H&G 14. 1897 10 pfg carmine on cream German postal stationery postcard overprinted KAMERUN and with '397f' control in bottom right corner addressed to Switzerland (genuine use) and cancelled by KAMERUN cds dated 11.6.98. BASEL arrival on front. A nice early use of this card. H&G 2. CAMEROONS (German) - 1917 5pfg+ 5pfg green PSRC unused. H&G 20. 1917-19 5pfg + 5pfg Green on cream postal stationery postcard in fine unused condition. H&G 20. CAMEROONS (German) - 1917 10pfg carmine PSC unused. H&G 19. 1917-19 10pfg Carmine on cream postal stationery postcard in fine unused condition. H&G 19. 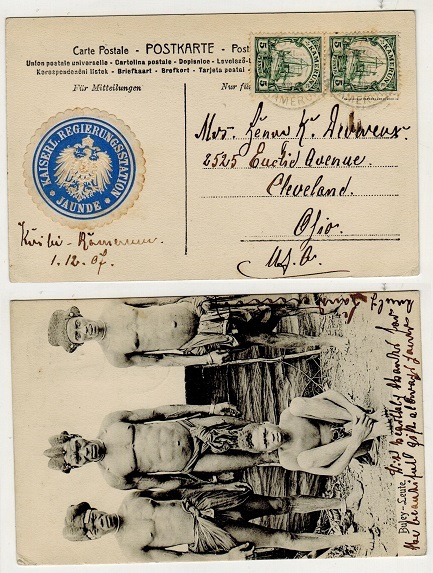 SOUTH WEST AFRICA (German) - 1911 5pfg rate postcard use locally used at KANUS. 1911 (1.7.) 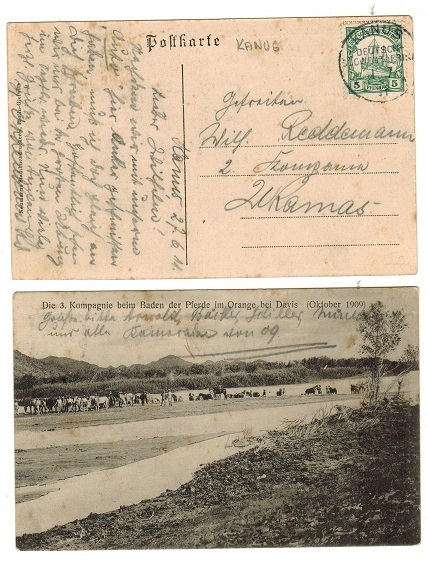 use of picture postcard addressed locally depicting 'Kompagnie beim baden der pferde im Orange bei Davis' (few tone spots) bearing German 5pfg 'yacht' adhesive tied by KANUS/DEUTSCH/SUDWESTAFRIKA cds. SOUTH WEST AFRICA (German) - 1912 5pfg green PSC used locally from SWAKOPMUND. H&G 19. 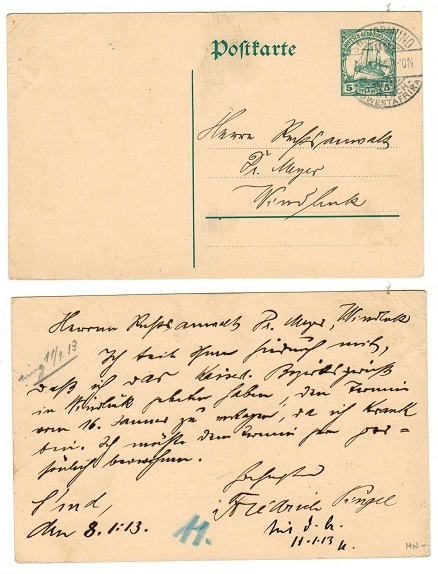 1912-16 5pfg Green on cream postal stationery postcard addressed locally & cancelled by fine SWAKOPMUND cds dated 8.1.13. H&G 19. SOUTH WEST AFRICA (German) - 1909 5pfg green PSC used locally from SWAKOPMUND. H&G 18. 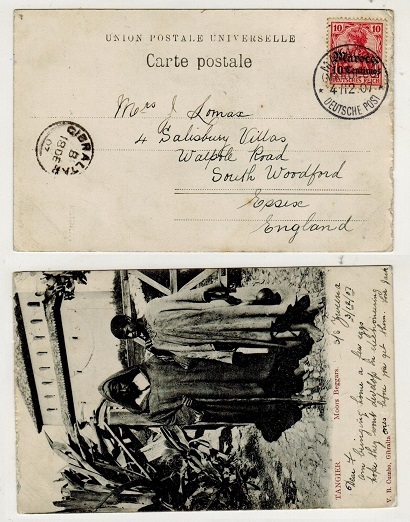 1909 5pfg Green on cream postal stationery postcard addressed locally & cancelled by fine SWAKOPMUND cds 4.5.12. H&G 18. 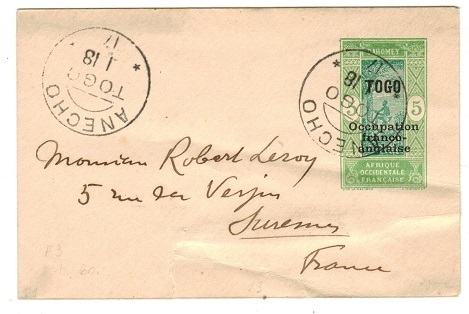 TOGO (German) - 1897 20pfg rate cover to Holland used at KLEIN POPO. 1897 (29.4.) cover addressed to Holland bearing German 20pf blue 'arms' adhesive tied by KLEIN POPO s/r cds with a further strike alongside. A nice fore-runner cover. 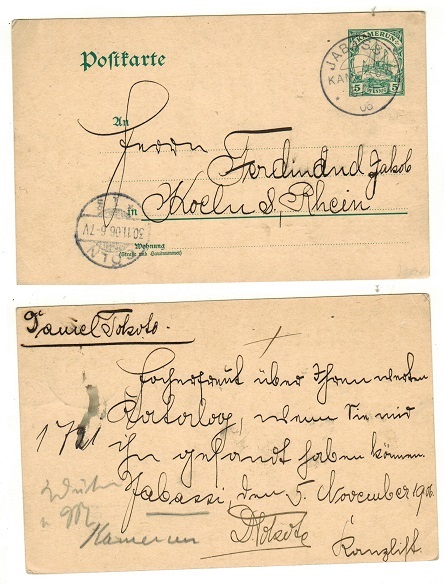 SOUTH WEST AFRICA (German) - 1912 5pfg green PSC used locally and cancelled KARIBIB. H&G 19. 1912-16 5pfg Green on cream postal stationery postcard addressed locally to Windhoek (genuine use) & cancelled by fine KARIBIB cds dated 9.8.14. A scarer use by German resident just after the outbreak of the First World War. H&G 19. 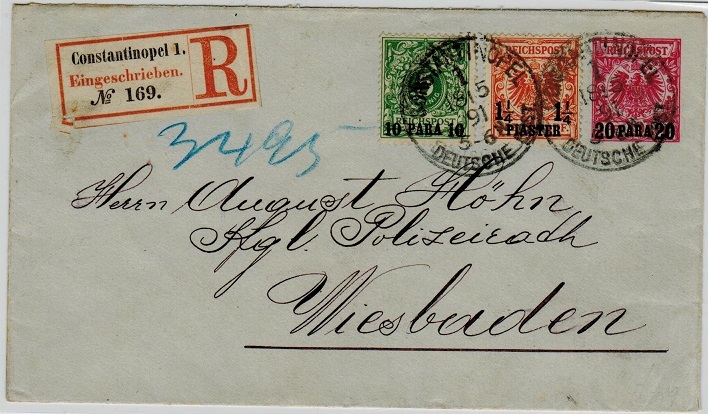 SOUTH WEST AFRICA (German) - 1909 5pfg green PSC to Germany used at OKAHANDJA. H&G 18. 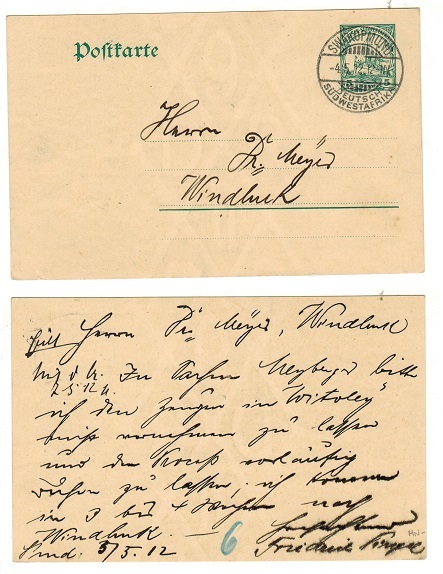 1909 5pfg Green on cream postal stationery postcard addressed to Germany cancelled by fine OKAHANDJA German cancel dated 24/4/11. H&G 18. 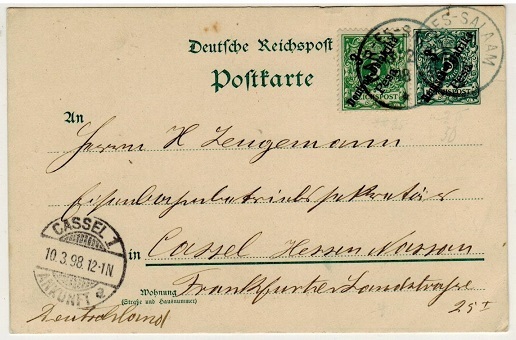 SOUTH WEST AFRICA (German) - 1900 5pfg green PSC to Germany used at GIBEON. H&G 13. 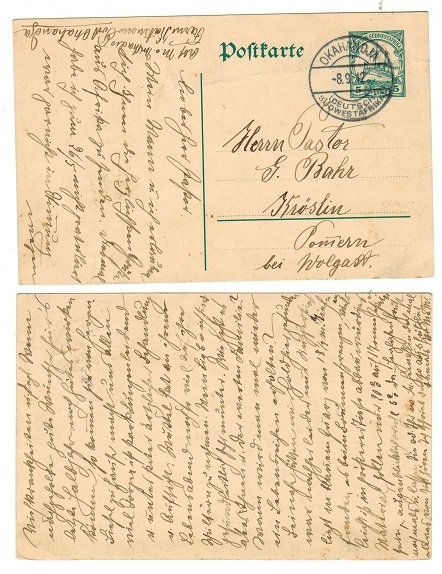 1900 5pfg green on cream postal stationery postcard addressed to Germany and cancelled by GIBEON cds. dated 1.8.08. H&G 13. 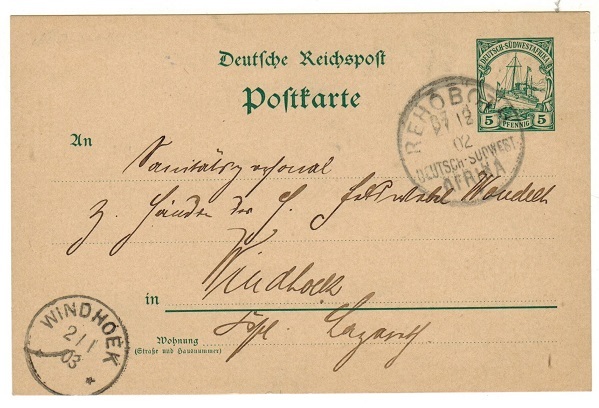 SOUTH WEST AFRICA (German) - 1900 5pfg green PSC to Germany used at REHOBOTH. H&G 13. 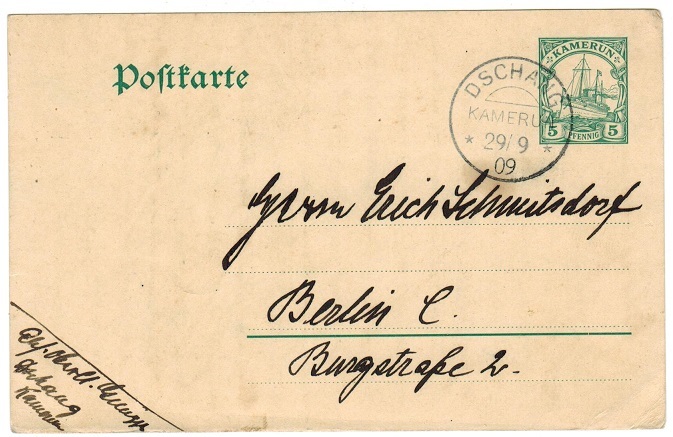 1900 5pfg green on cream postal stationery postcard addressed to Germany (genuine use) cancelled by REHOBOTH/DEUTSCH/SUDWEST AFRIKA cds dated 07.12.02. H&G 13. 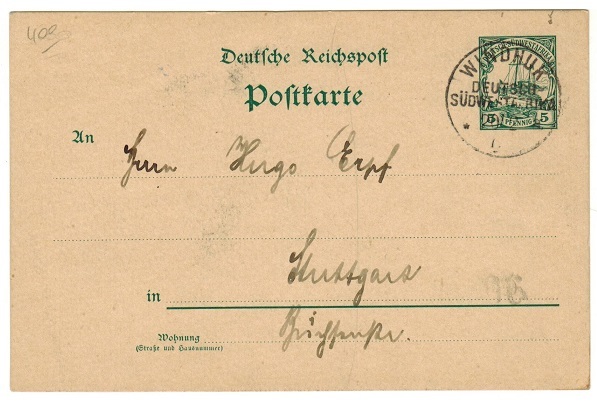 SOUTH WEST AFRICA (German) - 1900 5pfg green PSC to Germany used at WINDHUK. H&G 13. 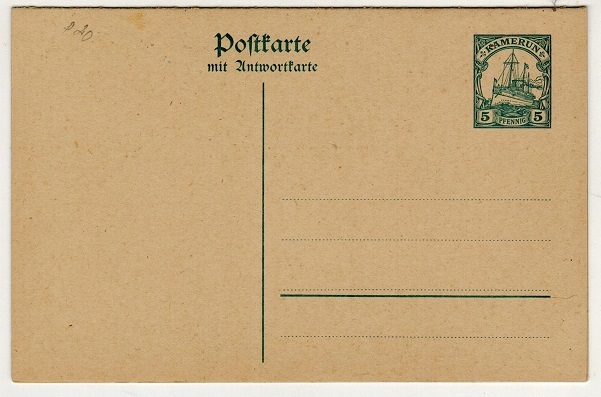 1900 5pfg green on cream postal stationery postcard addressed to Germany (genuine use) cancelled by WINDHUK/DEUTSCH/SUDWEST AFRIKA cds dated 20.2.05. H&G 13. 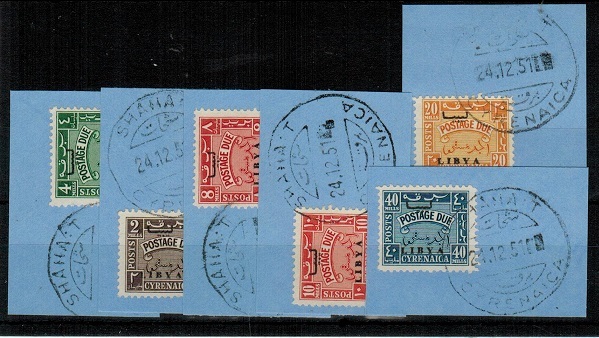 TOGO (French) - 1923 25c violet grey and orange PSE unused. H&G 5. 1923 25c violet grey and orange on cream postal stationery envelope of Dahomey in fine mint condition overprinted TOGO. H&G 5. TOGO (French) - 1921 10c orange grown and red PSE unused. H&G 4. 1921 10c orange brown and red on cream postal stationery envelope of Dahomey in fine mint condition overprinted TOGO. (Tip of reverse flap with minor fault having just touched envelope). H&G 4. TOGO (French) - 1921 5c yellow green and green PSE unused. H&G 3. 1921 5c yellow green and green on cream postal stationery envelope of Dahomey in fine mint condition overprinted TOGO. H&G 3. 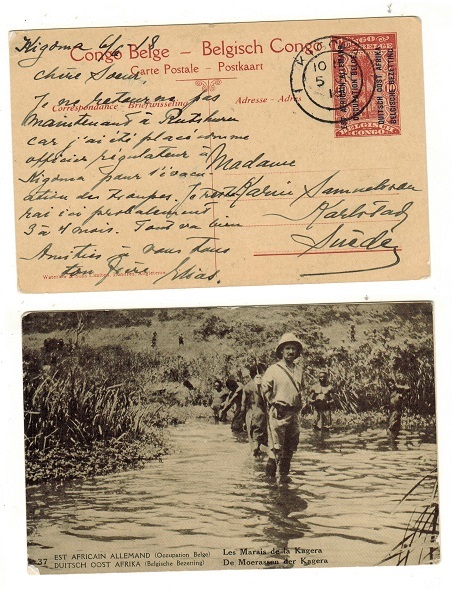 TOGO (French) - 1917 5c PSE (fault) addressed to France used at ANECHO. H&G 1. 1917 5c yellow-green and green on cream postal stationery envelope of Dahomey addressed to France (tear at bottom edge) cancelled by ANECHO/TOGO cds and dated 1.18.17. A scarce use of this stationery issued for the occupying French military forces. H&G 1. BRITISH LEVANT (German Offices) - 1890 10pfg PSE uprated to Germany used at CONSTANTINOPLE. 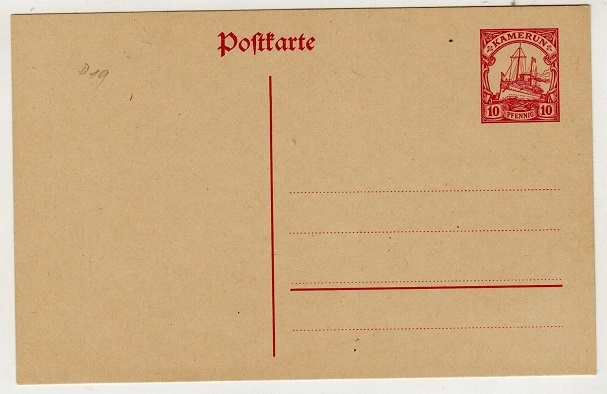 1890 10pfg carmine-rose on pale blue postal stationery envelope of Germany (H&G 13) registered to Germany bearing additional 10p on 5pfg and 1 1/4p on 25pfg adhesives tied by CONSTANTINOPEL/ DEUTSCHE POST cancels with black and red on white R/CONSTANTINOPEL 1/EINGESCHRIEBEN registered label at left. 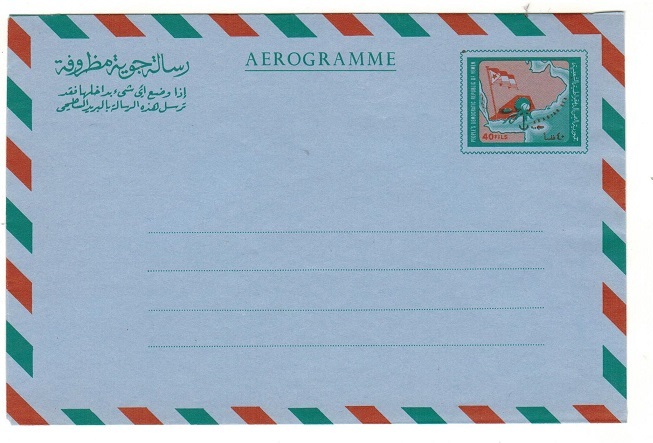 A scarce and attractive uprated piece of stationery used in Levant. 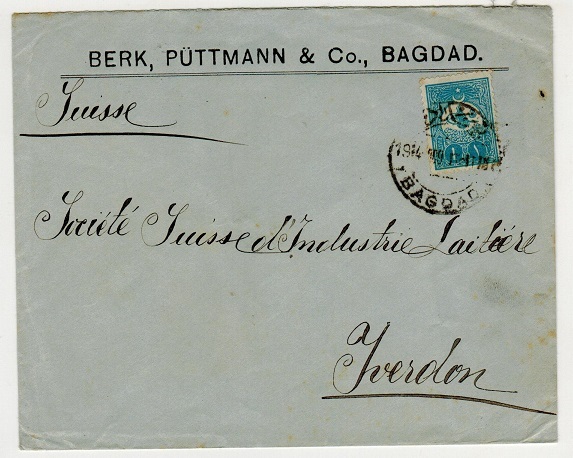 BRITISH LEVANT (German Offices) - 1899 3p rate registered cover used at CONSTANTINOPLE. 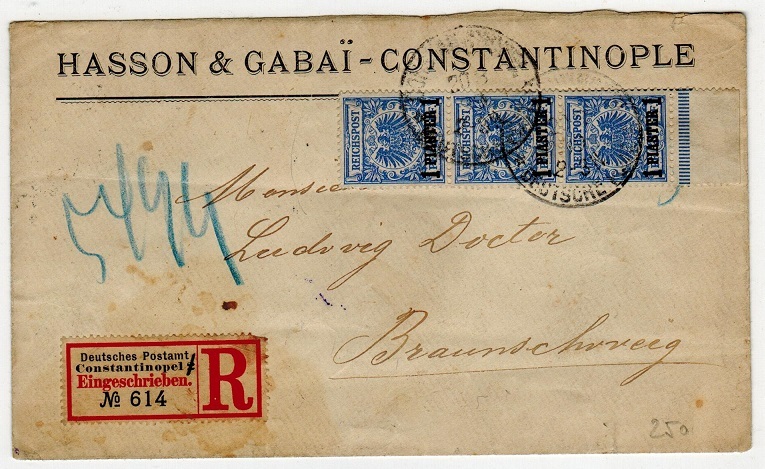 1899 registered commercial cover addressed to Germany bearing German 20pfg blue adhesive strip of three overprinted 1 PIASTRE in black and cancelled by s/r CONSTANTINOPLE.DEUTSCHES POSTAMT cds's. 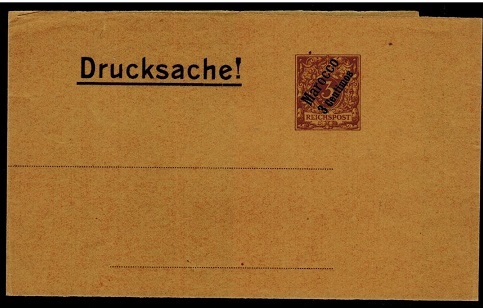 A scarce use of these German stamps used in Levant. BRITISH LEVANT (German Offices) - 1898 10pfg stationery letter card used by marine ship. 1898 (21.4.) 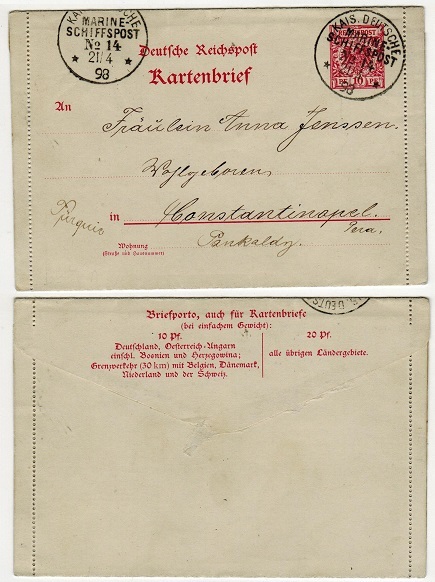 use of German 10pfg rose-red on cream German perforated letter card addressed to Constantinople cancelled by KAIS.DEUTSCHF/MARINE/SCHIFFSPOST/No.14 cancel which was in use by 'SMS Loreley' stations yacht stationed around the Turkish area. A scarce use. 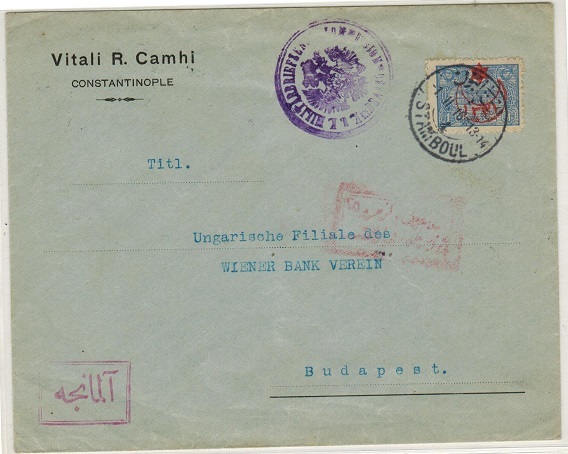 BRITISH LEVANT (Turkish Offices) - 1916 1p rate use on cover to Hungary used at STAMBOUL. 1916 (1.11.) cover addressed to Hungary bearing the red 'star and crest' overprint issue on 1pi dull blue provisional adhesive of Turkey cancelled by STAMBOUL cds. 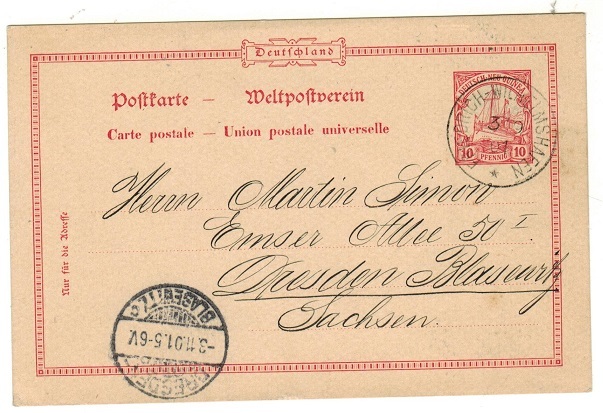 Large violet crested GERMAN COUNCELOR MAIL cachet at left. STAMBOUL/DEPART b/s. BRITISH LEVANT (Turkish Offices) - 1917 use of 20p red PSE uprated to Austria from SMYRNA. 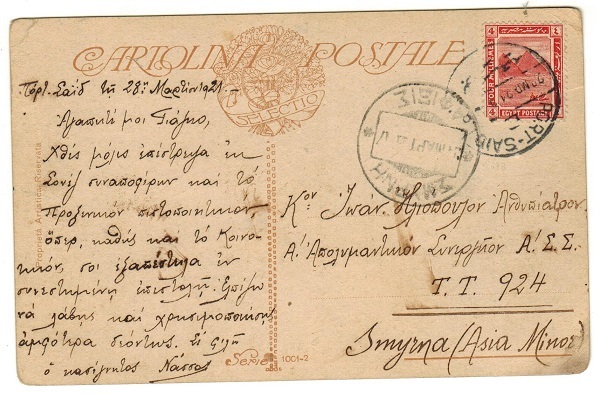 1917 use of 20 paras red on cream postal stationery envelope addressed to Austria bearing additional Turkish 10p and 20p 'star and crescent' overprinted adhesives tied by SMYRNA cds with Arabic boxed strike below. 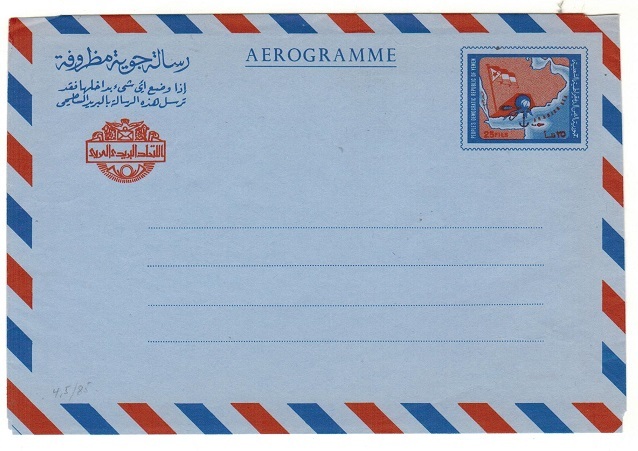 A scarce and attractive uprated piece of stationery used from Levant at this Turkish Office. 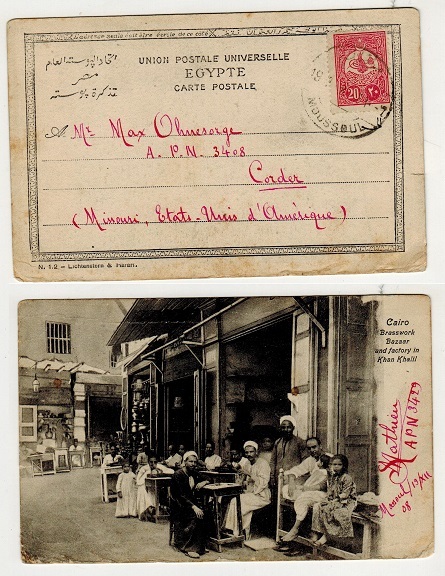 BRITISH LEVANT (Greek Occupation) - 1921 inward postcard from Egypt with Greek SMYRNA arrival. 1921 (MR.28.) inward picture postcard from Egypt addressed to Smyrna with scarce Greek arrival cds used during the occupation. 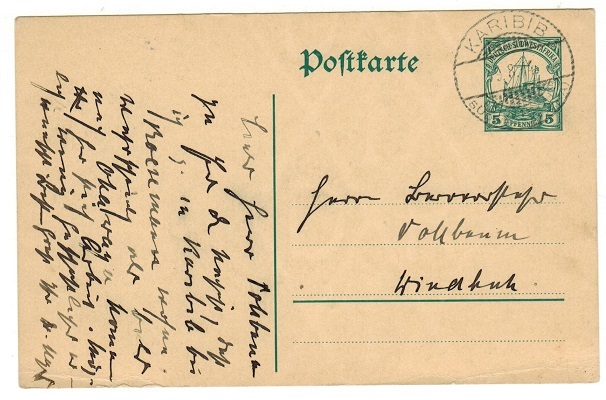 SOUTH WEST AFRICA (German) - 1912 5pfg green PSC to Germany used at OKAHANDJA. H&G 19. 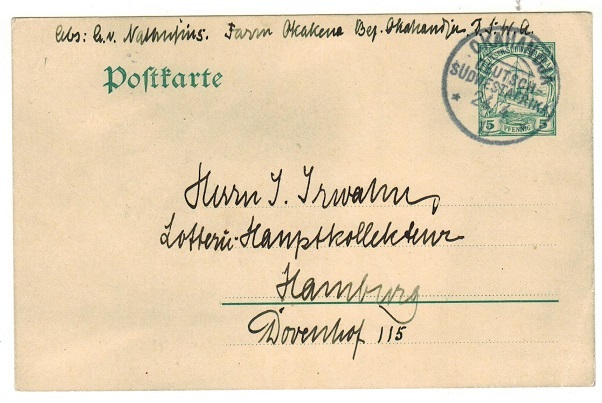 1912 5pfg green on cream postal stationery postcard (divided line) addressed to Germany (genuine use) cancelled by OKAHANDJA cds dated 8.9.12. H&G 19. 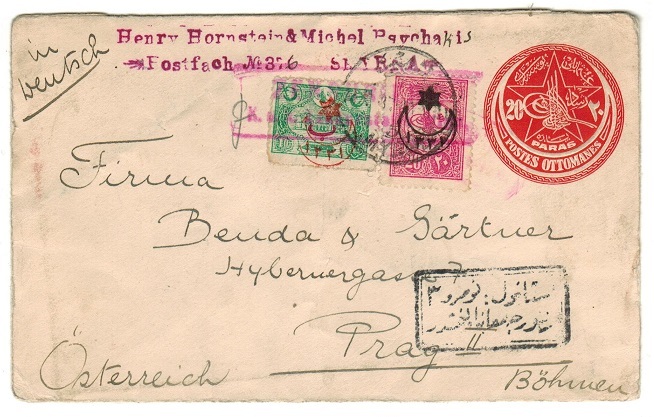 IRAQ (Turkey used in ) - 1914 1p rate cover to Switzerland used at BAGDAD. 1914 commercial cover addressed to Switzerland bearing 1pi bright blue adhesive tied by BAGDAD cds. IRAQ (Turkey used in) - 1908 20p rate cover to Iran used at BAGDAD. 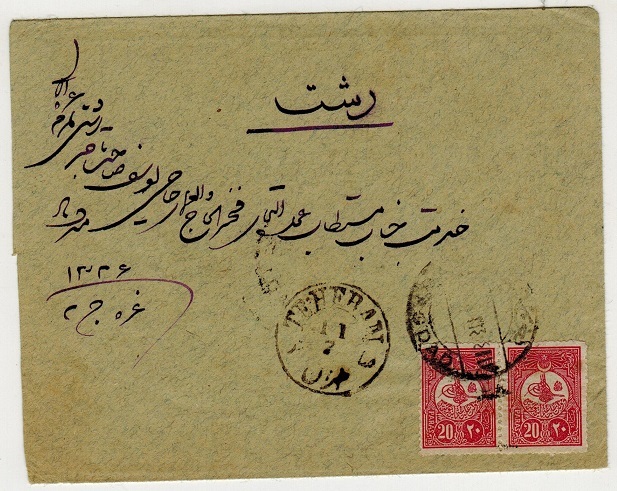 1908 cover addressed to Tehran bearing Turkish 20pa rose-carmine adhesive pair tied by BAGDAD cds and with TEHRAN arrival alongside. IRAQ (Turkey used in) - 1908 20p rate use of postcard to USA (scarce) used at MOUSSOUL. 1908 (19.3.) use of picture postcard addressed to USA depicting 'Cairo-Brasswork Bazar' bearing Turkish 20 para adhesive tied by MOUSSOUL cds of Iraq. A scarce fore runner. IRAQ (Turkey used in ) - 1908 20p PSC to Germany used at BAGDAD. H&G 12. 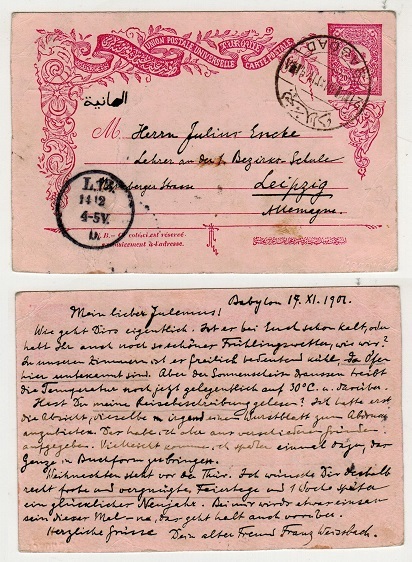 1908 20 para red-violet on pink postal stationery postcard of Turkey (H&G 12) with border decorations addressed to Germany and cancelled by BAGDAD cds dated 19.XI.1907. 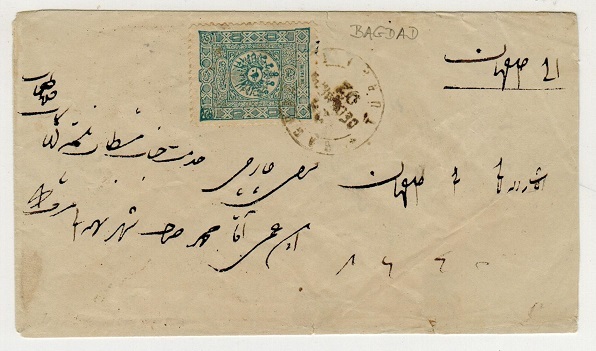 IRAQ (Turkey used in) - 1902 1p rate cover used at BAGDAD. 1902 (DEC.23.) 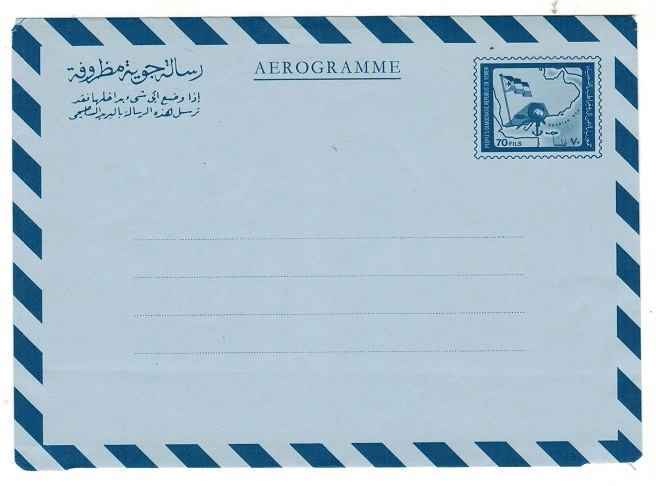 cover addressed in Arabic bearing Turkey 1p dull blue adhesive (SG 143) tied by d/r BAGHDAD/TURKEY cds. A scarce early fore runner cover.